The French Blue design 40 Blinks Sleep Mask features a popular design that is one of our best selling masks. The 40 Blinks Sleep Mask range is stunningly designed and exudes modern design with functionality. The 40 Blinks Sleep Masks have been rated #1 by Good Housekeeping Magazine and have been featured in the Hit TV show "BONES". These masks are definitely fashion, function & fun! They feature striking prints and designs that make this sleep mask a definite fashion statement. The main reason people cant sleep is too much light—darkness stimulates the natural Melatonin production, which helps you achieve deep, restful, and restorative sleep. 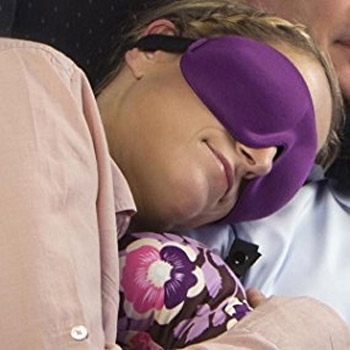 Use the 40 Blinks on flights, during short naps, in college dormitories, or for a better quality of sleep at home. Sleep well with comfort and convenient sleep! Traditional sleep masks feel heavy on the eyelids, let ambient light in, and use elastic loops that pull on the ears. 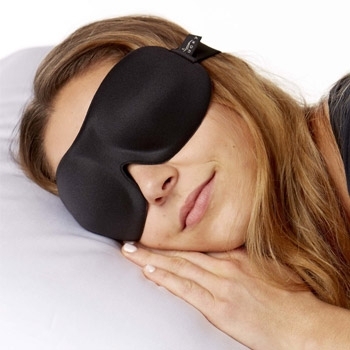 The 40 Blinks Sleep Mask is specifically designed with the utmost comfort in mind—the soft, ultralight design blocks light fully and gently hugs the face without pressure using the adjustable Velcro strap that connects at the back of the head. Deep molded cups allow space between the eye and the mask so you can blink freely without pressure. Made with a fabric that is extremely lightweight, breathable, flexible, and durable, a good night's sleep is guaranteed! The mask is 9.5” wide and 3.5” tall. Eyecups are .5 inch deep. Ultralight, this sleep mask weighs only .7 ounces or 37 grams. Helps with insomnia and other sleep disorders. Used to protect lash extensions during sleep. Deep molded cups allow you to blink freely.